2009 Clos Pepe Estate Chardonnay Barrel Fermented: Retail $35. According to Cellar Tracker, I have had seven of these bad boys. Is it possible that I have not noticed until now that Wes Hagen decided to use a composite cork for these bottles? I am not sure, since I would have no doubt railed against the practice in other notes had I noticed. On the other hand, it would require a bit of a complete imbecile not to notice. The wine? What I have come to expect from Clos Pepe. Reminiscent of a Chassagne Montrachet (albeit with a Yellow Tail cork) on the nose, I could sniff this one all night. Quite tart on the palate, though, with a more Chablis-like initial impression. The finish is stellar, with hints of oak and a dash of creaminess. I will miss Clos Pepe wines immeasurably, and the Chards more than the Pinots (but only slightly). Outstanding. 90-92 Points. 2009 Couly-Dutheil Chinon La Baronnie Madeleine: Retail $25. 100% Cabernet Franc. A bit dark in the glass with some dark berry fruit and a bit of heat (13.5%) on the nose. On the palate this is just short of a whoa. A bit of cassis up front followed by some earth and an admirable finish. Needs a bit more time perhaps. Outstanding. 90-92 Points. NV Heidsieck & Co. Monopole Champagne Blue Top Brut: Retail $45. I bought this on a whim after a memorial service to celebrate the deceased. I was in the Mid-West, so sadly, the choices were rather mundane. It has been a while since I had a Blue Top, so I opted for this over the more pricey Veuve Clicquot. Not disappointed at all. Good depth and sparkle–it did lack a little in backbone, but I nit-pick. If you can get this for $30, buy it. At the $45 I paid? A bit of a wash…. Very Good. 88-90 Points. NV Orlana Vinho Verde: Retail $10. I picked this up from Whole Foods for $8 as I was headed over to my mother’s house for dinner. To my knowledge, I had never had a rosé Vinho Verde, although I have had a ton of the “regular” style. This bottle was under screw-cap, but I still anticipated that it would be frizzante like its paler brethren. It wasn’t. Nary a bubble to be found. Still, this was as tart as you would expect with some modest fruit (an a particularly modest price). Perfect for my mother’s palate (although the box of Franzia White Zinfandel in the fridge suggested she would have preferred some sweetness). Good. 84-86 Points. 2012 Seghesio Family Vineyards Zinfandel Rockpile: Retail $50. Big, but not quite obtrusive at 14.8%, as the wine is nicely balanced. Nice blackberry and cassis, with a bit of mocha and caramel. I would classify this as a bit of a “tweener” it is not one of those overly rich, fruity, opulent Zins that I eschew, but there is more to it than a cool climate Zin that takes a bit of finesse to understand. In the end, this is certainly a winner, as I can imagine the bike ride up to Rockpile gazing over Lake Sonoma as I sip. Outstanding. 91-93 Points. 2012 Siduri Pinot Noir Sonoma County: Retail $30. A bit bigger than I thought it would be, with big red fruit and a hint of heat (14.2%) on the nose. On the palate, equally big and robust, but I bought this after the memorial service for a good friend. It certainly matched his personality, although the wine had a bit less depth. Still, a quality wine that is fun to drink. Very Good. 88-90 Points. 2011 Cantina Zaccagnini Montepulciano d’Abruzzo Vino dal tralcetto: Retail $15. 100% Montepulciano d’Abruzzo. It is what it is. This is not a world beater by any means, but with burgers or pizza, this is a fine match. A bunch of fruit on the nose and the palate, but not much depth. It’s fine. But I still don’t get the thingy on the bottle. Good to maybe more. 85-87 Points. DRINK OF THE WEEK: It has been a few weeks since I have written a “What We Have Been Drinking” post since I have been traveling a bunch. First, it was a trip out to the West Coast to visit my in-laws and spend several days in Sonoma. Right when I got back from that trip, I turned around and flew west again (this time to the Midwest) for the memorial service of a dear friend of mine. I bought a few bottles that we shared at the luncheon after the service, and I though that one of those would certainly be the Wine of the Week. I also thought about the Clos Pepe since after the 2014 vintage is bottled, it seems as though the label will no longer exist. It was not until I sat down to write this, however, that I knew that I needed to make the Vodka Gimlet the Drink of the Week. Why? Well, it is really all I ever saw my recently departed friend ever drink, and he was quite particular about it. Later in the evening, a few of us got together at the Box Bar in downtown Plymouth, Michigan and all had a Vodka Gimlet. I am not much of a cocktail drinker, but we all felt that our friend would have approved. 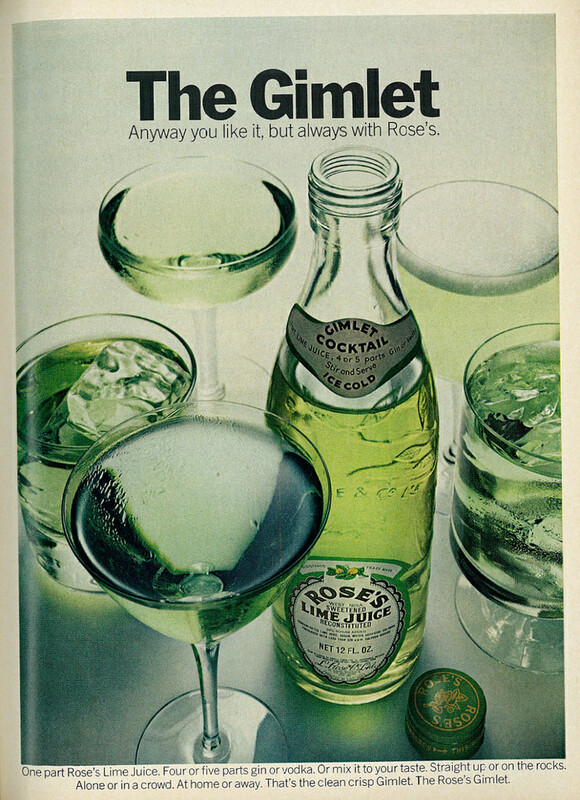 I remember back in high school, he would take me out to dinner and on several occasions we would have to leave the restaurant once he learned that the establishment did not use Rose’s Lime Juice in its gimlets. I am not sure if that is the reason that I will often choose my restaurants based on the wine list, but I like to think that it is. So here is one last toast: the Vodka Gimlet is this month’s Wine Drink of the Week. This entry was posted in Champagne, Chardonnay, Montepulciano d’Abruzzo, Pinot Noir, Vinho Verde, Wine, Zinfandel and tagged Argyle Pinot Noir, Argyle Pinot Noir Nuthouse, berry fruit, California wine, cellar tracker, Chardonnay, Pinot Noir, Skewis Pinot Noir Anderson. Bookmark the permalink. Sorry for the loss of your friend, but I’m sure he would have appreciated the drink in his memory. Are you unfamiliar with Wes’ rant against natural corks. He hates them and has shared his feelings about them in one of his YouTube blogs if you want to check it out. He said he would bottle everything with screw caps if he could! Nice Pinots on your list;I bet the Seghesio Rockpile Zin was awesome; great vineyard! My best wine of the week was Alban Vineyards 2005 Edna Valley Lorraine Syrah. First RP 100 pt wine I have had…all I can say is WOW! Yeah, I have talked with him about it before and glad he finally moved to screw caps instead of the composite stoppers. His Chards are certainly worthy of aging, and I would much rather them be under screw-cap than those abominable agglomerated things. My sister visiting from Austin this past week introduced me to the standard Vinho Verde from our local Trader Joe’s. I really enjoyed the light bubbly wine, it was an excellent choice to drink with our appetizer of baked Pita Chips and Vermont white cheddar cheese she also bought there. The screw cap didn’t bug me at all, lol! I agree! VV is a delightful drink on all levels–including the price! It is what we served at our wedding. I think I liked the ’08 Riserva slightly more, but splitting hairs–both were magnificent!